I can't log into my account. Help! If you forget your password, or if you are getting a "Login in Failed" message, then you can easily get access to your password using "Forgot username or password" link on the log in screen. Go to www.webreserv.com and click "Login" in the upper right hand corner. On the User Login page, click the link "Forgot username or password?". 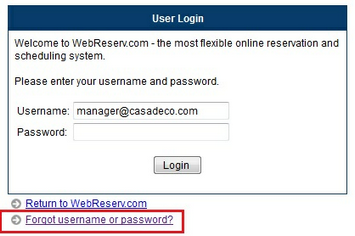 On the Forgot Password screen, enter the email address on file with WebReserv, and select "Send Login Instructions". If the email address matches, then you'll get a notice indicating that login information will be sent to that email address. Check your inbox for further instructions on how to log in. Important! If you are unsure of the correct email address that you used as your username, then please contact our support team at support@webreserv.com or 877.692.6962 for further assistance.